The United States consistently experiences shifts impacting the importance and prevalence of stateside manufacturing operations. Once the backbone of the nation’s economy, manufacturing strength within the U.S. has, at times, taken a back seat to service industries and other business sectors. In fact, under certain economic conditions, businesses have actively moved production outside the country, taking advantage of lower labor costs available elsewhere. Regulation and compliance requirements have also compelled producers to settle in other localities when building and expanding manufacturing capabilities. Manufacturers are beholden to stock holders and business owners, so they make prudent moves to bolster profitability and maintain viable operations. Moving offshore still presents itself as a cost-saving opportunity for some companies, but others are moving in the opposite direction. In an increasing number of cases, manufacturers are looking to U. S. soil when locating production facilities. The trend, known as reshoring, brings business back to the United States, fortifying the nation’s manufacturing presence and creating employment opportunities for the domestic work force. The practice of taking would-be American jobs away from U.S. workers, by locating manufacturing operations and sourcing services in other countries is known as “offshoring”. The practice has been commonplace for decades, as American companies and other international firms strive to stay competitive with global producers. Low priced imports from certain regions, particularly China, have made it difficult for domestic producers to compete on price alone, despite some of the advantages of running U.S. – based facilities and contracting with domestic providers. Labor costs, in particular, have been artificially low in other areas, significantly trimming production expenses for manufacturers operating offshore and utilizing global resources. As a result, many producers have migrated operations to low-cost regions, known for cheap production, and shifted fulfillment of services to international providers. The subsequent competition has perpetuated reduced manufacturing output from within U.S. borders, but the trend appears to be reversing, in many cases. As global labor costs rise, offshoring advantages become less clear, so the scales are shifting back toward U.S. production. “Re-shoring” lures manufacturing work back to U.S. territory, rather than outsourcing offshore. The net result adds to the GDP, and more importantly, creates opportunities for ancillary business – including contract packagers poised to take-on re-shoring challenges. According to some observers, the rise in reshoring opportunities appears related to several factors. Increased labor costs in other regions, namely China, have made offshore avenues less appealing in recent years. General volatility in the region has also made it less of a “sure-thing” for producers, which are less willing to gamble precious resources, when the future appears uncertain. Shaky supply-chain management is another factor limiting success offshore. Despite globalization of goods and services, long-distance management presents challenges – even for seasoned international operators. As a result, many companies are finding it easier and more effective to partner with experienced packaging firms, leaving sourcing and logistics to U.S.-based providers. Easing domestic energy prices adds fuel to reshoring efforts, furnishing recent access to reasonably priced power. Abundant, cheap energy eliminates a major hurdle for producers, which typically leads businesses offshore, when domestic energy prices are high. In addition to tangible monetary rewards, reshoring takes full advantage of U. S. labor force excellence, including higher productivity levels and consistent output. Re-shoring opportunities are on the rise, including initiatives and partnerships involving major domestic retailers. 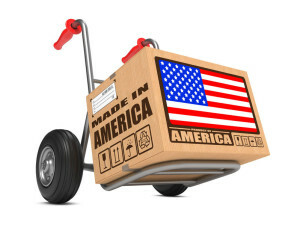 As Wal-Mart and other companies push for greater manufacturing presence within the U.S., successful contract packagers benefit from re-shoring opportunities. In addition to greater labor-cost parity across markets, reshoring companies are finding higher levels of collaboration and reduced transit time across the supply chain. These logistical advantages, once eclipsed by the high cost of doing business in the U.S., are now worthy of the cost and disruption of bringing business back to The States. Global economics are complex, so analysts have differing views about reshoring. To some, there are few net gains for the U.S., which continues to send production elsewhere, even as some companies return to domestic production. The reshoring trend has also been around for a while, so data is available pointing-up successes and failures among companies returning to the U.S. GE, for example, made headlines with its pledge to invest and reestablish appliance manufacturing in Kentucky, providing a valuable case-study for those interested in the impacts of re-shoring. According to a recent study, 70% of respondents found that sourcing in China was more expensive than they thought it would be and more than ninety-percent believe Chinese labor will continue to become more expensive in the future. As a result, many of those studied projected moving operations to the United States on a larger scale, in the near future. In a similar approach, “near-shoring” brings business close to home, locating facilities in Canada and Mexico for access to U.S. goods and services. Measuring the cost-effectiveness of re-shoring is an individual prospect, left for each producer to dissect. One thing is certain, however; packaging plays a central role in these important calculations, so contractors prepared to address reshoring needs maintain a competitive advantage. Multiple facilities, strong supplier networks, and experience migrating business across international channels are key competencies for packagers seeking to take full advantage of rising reshoring opportunities.